As far as internet speeds go, India is as good as it is in Olympics. Sometimes I do wonder; how do we lack so much in certain things in which we can be at par with other nations easily? We published a cartoon as well regarding this – Check it out. The speeds in India are at a rise. We have finally left the Kbps era and many of us are now used to our Youtube videos actually running without leaving them to buffer for an hour. As I have asserted several times that the shift from Wired Broadband to 2G and 3G technology and Dongles has been the primary reason for this. Somehow, our country responds far better to mobile technology than it ever did to wired one. We have, in some ways, skipped the wired generation completely. Computers were successful but mobile phones overshadow them. Similarly, mobile internet has become the beacon around which our internet system is evolving and will evolve in the future. Especially the advantage of tethering; I suppose has changed the way we use internet on mobile. In fact, I use my dongle for regular use but when I need speed, I prefer my mobile internet. This indeed speaks volume of the growth of mobile internet. It is even better to see that Government realizes this and is making an effort so that we do not see the delay that we have seen earlier in technology coming to India. 3G reached in India when bigger and better countries were moving to 4G. 4G in India is currently in nascent stage and not just because of price but because of reach. Eventually 4G will become commonplace but it is not anytime soon. 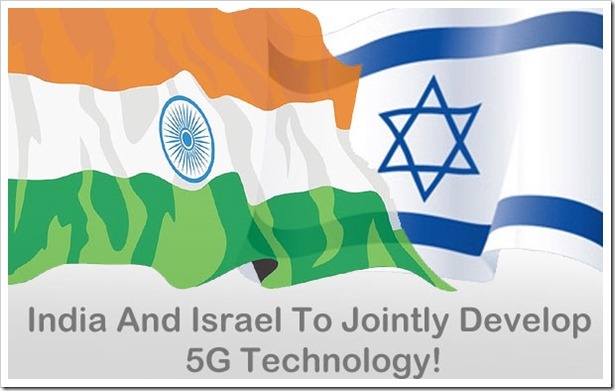 In such light, it is heartening to see that India and Israel have agreed to jointly work on the development of 5G technology. There are two-fold advantages of that. 1. No other country has deployed 5G yet. In fact, the companies testing it, believe that it would take around 5 years for 5G to come to market. This means that we would be perfectly placed to be in step with the rest of the world where 5G is concerned. 2. Israel is known for its technology and innovation. This means that the quality of 5G would not be lacking and would be at par with any other 5G technology. The matters regarding 5G were discussed when Telecom and IT minister Kapil Sibal visited Israel last month. Looking at the jump from 2G to 3G in terms of internet speeds and from 3G to 4G, it will be really exciting to see what 5G will have to offer. Theoretically, it can reach to about 1 Gbps which is the speed of fibre optics network. Let’s see what fruit this joint venture bears. You said No other country has deployed 5G yet. In fact, the companies testing it, believe that it would take around 5 years for 5G to come to market. But the US has it already. This article was written this year correct?